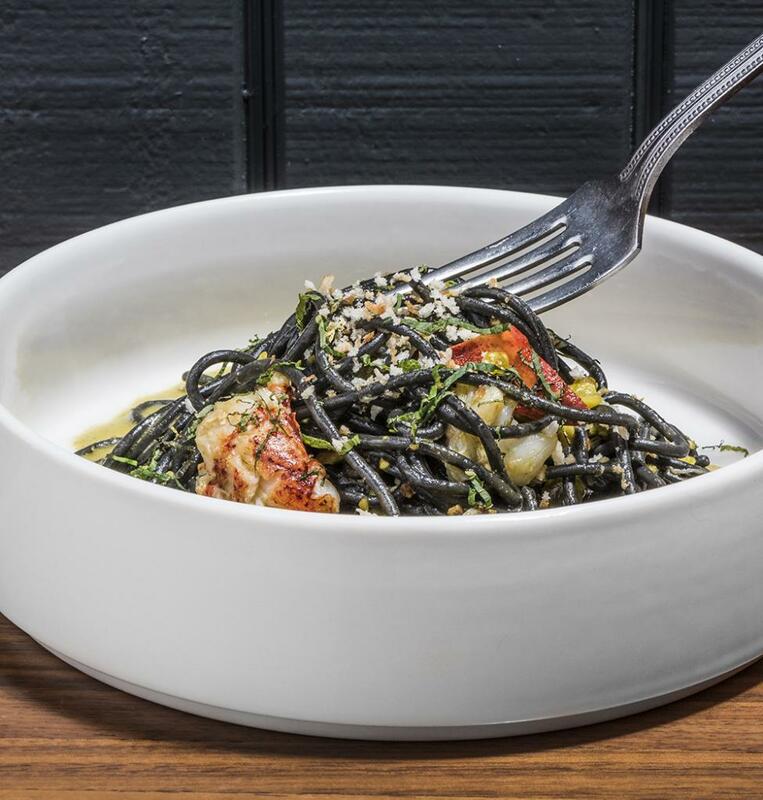 Black squid-ink pasta, perfectly made. Crunchy pistachio pesto. Rich bites of poached lobster. And a gremolata with just the right amount of mint floating through each bite to tie the various elements together. This dish, the spaghetti di nero at Eighth & English, manages the trick of being surprising and deeply satisfying, original and soulful. By far my favorite menu item after my two visits, it combines high execution with a kind of daring that shows what a fine chef Chase Blowers can be. Spaghetti di nero with poached lobster (top) and halibut with sticky rice and coconut curry (bottom). 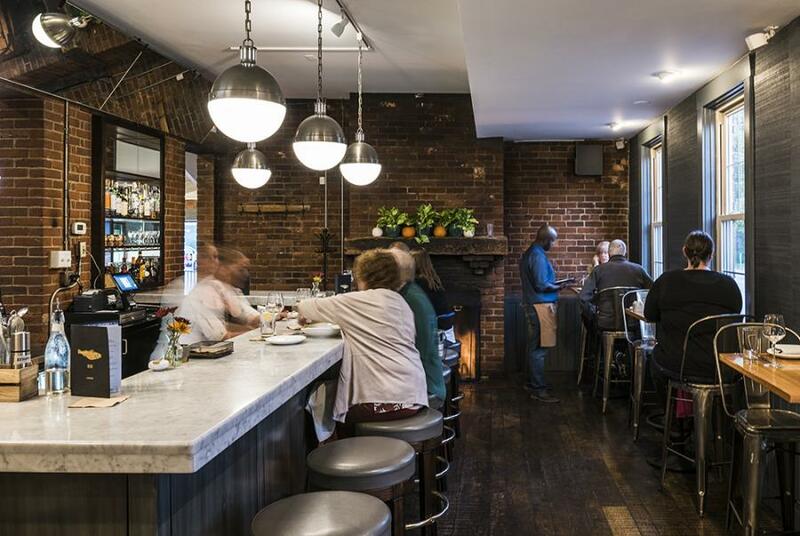 Blowers, the chef and owner, named Eighth & English after an inspiring eighth-grade English teacher in Harrison, who Blowers credits with opening up new vistas of art and culture for him. After several years at Boca and the National Exemplar, Blowers launched his own restaurant in the cozy and elegant space Enoteca Emilia used to occupy in O’Bryonville, which I would locate roughly at the intersection of Seafood & Italian. The daily oyster special with horseradish, scallion cilantro vinaigrette, and spicy cocktail sauce. There are some global touches—a tabbouleh side dish, a curry coconut California halibut with basil and lime, my favorite entrée. 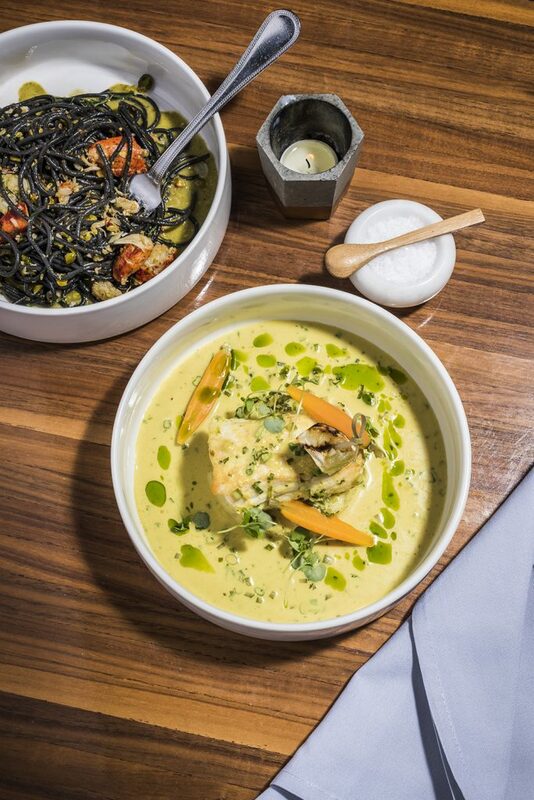 Still, from the Primi section, which is all pasta, to dishes with gremolata and olives and mosto cotto (a kind of grape molasses), the bass note running through the menu is Italian. 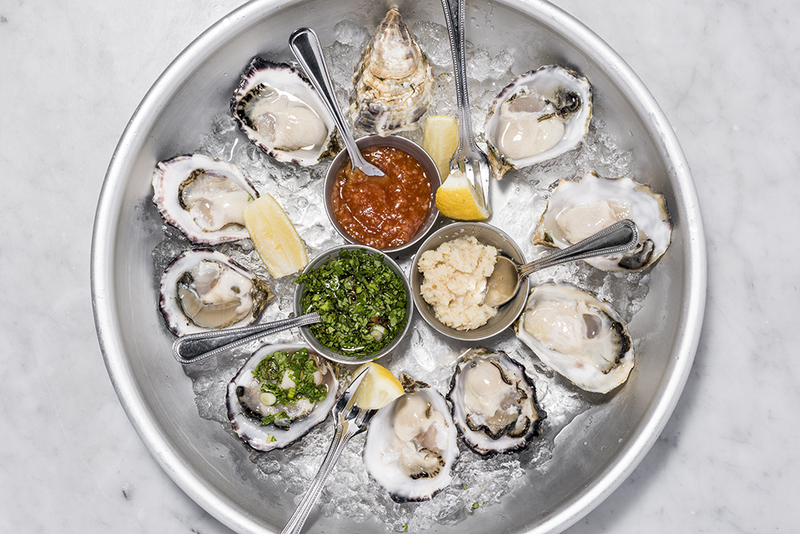 Any restaurant specializing in seafood has to answer first to the quality of its raw materials, and here Eighth & English delivers. The tray of kusshi oysters (Japanese for precious) were so sweet and creamy that I stopped using the accompanying red wine mignonette so I could enjoy them without distractions. Every piece of fish, from the whole branzino to the trout, clearly hadn’t been out of the water for long. It did feel slightly incongruous for the waiter to talk about the menu’s focus on seasonality (which means many of the dishes I tried are no longer available), knowing that the central items on the plate were flown in from places like Greece and New Zealand. If you want to eat ocean seafood in Ohio, though, that’s the cost. Like its predecessor, Eighth & English has maintained high standards on wine, and the staff is knowledgeable and accommodating. They kindly brought a taste of an unfamiliar varietal to my friend’s wife, and suggested an inexpensive bottle of Muscadet at our second meal, an impressive biodynamic wine from Julien Braud that was dry with a hint of tart apple, the perfect accompaniment for the oysters. The only bit of forgetfulness was a waiter who never brought out the promised bread. I realized what a loss this was during the second meal, when we received a basket of slices from Allez. Oh, what good bread—chewy and crusty, with an Old World body and substance. The menu at Eighth & English encourages the sharing of several small plates. Do this for a few meals, and some patterns emerge. The register is decidedly subtle, with a studied delicacy to both the flavors and the presentation. Sometimes, the results are lovely, like the swordfish meatballs placed atop a creamy, impeccably made polenta, or the smoked trout croquettes with a nice dill crème fraîche. In other dishes, though, the delicacy becomes a kind of tentativeness. I searched in vain for the fiery harissa in the lamb sandwich, which must have been mixed in with the meat in minute quantities; the dish was still good, but with a little more assertiveness could have been great. I struggled to taste the mint in the panzanella, or the Calabrian chili in the broccolini; they were so far in the background that their contribution was almost inaudible. This tendency extends even to the cocktails. My friend’s jalapeño-infused Chocheman Reyes was barely spicy and tasted mostly like an ordinary margarita. In some of the entrées, like the New York strip, the restraint is a virtue, because the meat, with just an herb-infused oil, speaks eloquently for itself. In others, it is a mixed blessing. The smoked trout, a beautifully composed plate with tomato beurre blanc and bright orange globes of trout roe, needed seasoning before its subtle palette of briny roe and buttery leek came into focus. (There is a little pot of salt on the table, and it is possible that the consistent undersalting is a conscious decision.) I should note that my friend loved the branzino, so my opinion might deserve its own grain of salt. The most unusual item on the menu is a marinated watermelon salad with olives, feta, almonds, and shaved mojama. I ordered it twice to puzzle it out. The dish is texturally balanced, with crunch and softness, but despite the fascinating pairings of salty and sweet, the flavors had a wavering, uncertain quality, like a chord that’s missing some note that would move it to a satisfying resolution. I salute the attempt, though; it is a bold composition that just needs a few more elements to work. Spaghetti di nero with poached lobster and pistachio pesto. Eighth & English may specialize in seafood, but I think its soul is in the pasta. There was a brio and depth of flavor in these dishes that made you want to immediately come back and order them again. 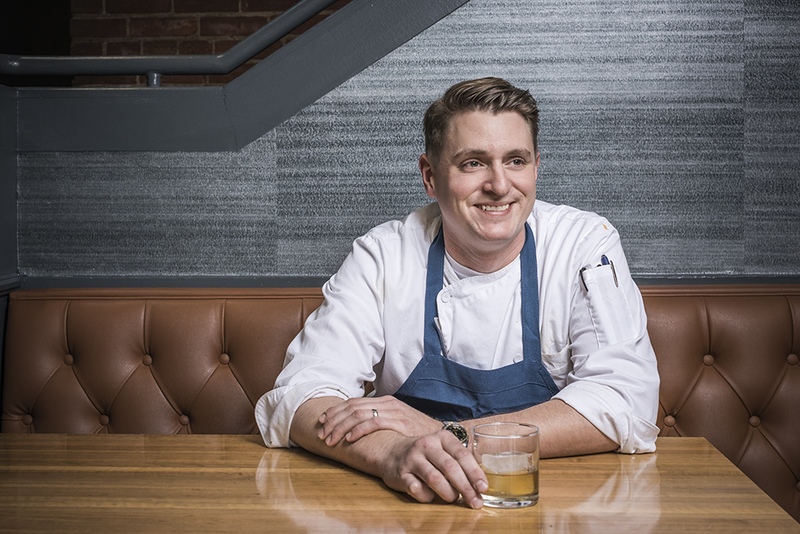 Blowers has talent and resources to spare, and his restaurant is still in its early days. Here’s hoping he can take the verve and identity I tasted in those plates and spread it to the entire menu.